A tropical evergreen tree Native to China. Has very small (less than 3/4") green leaves which are lightly veined and almost bronze when they emerge. The Sageritia sheds its bark and the trunk becomes multi-colored. Small pink-white flowers in spring give way to small black fruits during the summer and into autumn. 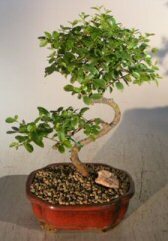 A very popular bonsai for indoors.